Federation Council backs bill on punishment for preretirement employees’ dismissal | Russian Legal Information Agency (RAPSI). 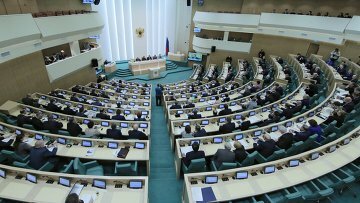 MOSCOW, October 3 (RAPSI) – The Federation Council on Wednesday approved a bill on punishment for unjustified denial of employment and dismissal of persons nearing retirement age, a statement published on the website of the upper house of Russian parliament reads. The State Duma adopted the document on September 25. Under the draft law, preretirement age is understood to be an age-related period with a running time of up to 5 years prior to granting an insurance old-age pension to an individual. The bill stipulates fines of up to 200,000 rubles (about $3,000) or in the wage amount for a period covering 18 months at the most, or community service for up to 360 hours for unjustified denial of employment and dismissal of such persons. Amendments are proposed to the Criminal Code. Positive feedbacks on the bill have been provided by Russia’s government and Supreme Court. On September 27, the State Duma, Russia’s lower house of parliament, adopted the pension system change bill in the third and final reading. According to the draft law, the age of 65 years would be set as retirement age for men, and 60 years for women.